All busy city centres need to avoid the occurrence of anti-social behaviour, particularly in the run up to Christmas. Working with the Safer Neighbourhood team at Milton Keynes Council and Thames Valley Police, we created a campaign to warn revellers of the consequences of anti-social behaviour. 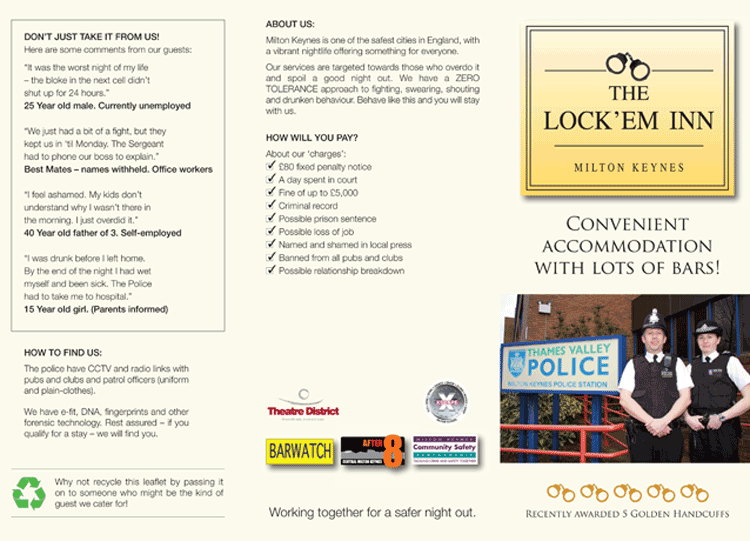 We published a mini hotel guide for the Lock ‘Em Inn, a guide to spending the night in the cells at Milton Keynes Police station. The guide was distributed in pubs, bars and nightclubs around the city centre and was supported by poster and PR activity.